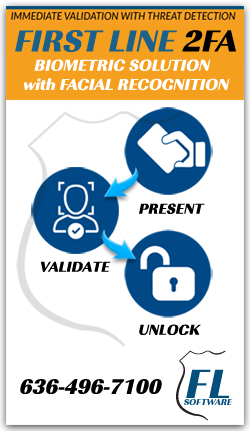 Corporations – Business leaders and owners use First Line Facial Recognition for surveillance enhancement, threat detection, access control, concierge and badging. Depending on the nature of the company, business leaders see value in several areas according to their specific pain points. These pain points include areas in which drugs are stored, expensive inventory, data rooms, chemicals as well as expensive equipment and R&D centers. Often area management is critical to these corporations, and the objective is to make access in and out of these areas seamless for “authorized” individuals. Access control is continually moving away from cards and key fobs due to their potential of being lost or stolen. Employee attendance can also be monitored using First Line Facial Recognition. This is especially true in manufacturing where time often has to be validated to ensure accurate payroll. Most importantly, workplace/domestic violence prevention is an important capability to this product. If threats are made against a company or a specific employee, the individual can be labeled a “threat,” potentially averting a violent incident. Banks – First Line Facial Recognition has demonstrated significant value in protecting data storage, customer records and record retention areas, but it is the concierge capabilities that will set the responsiveness to customers above and beyond the typical customer experience. Priority customers entering the bank can be immediately identified for that extra special attention they deserve. Additionally the system can be deployed as access control in a bank branch for offices and vault areas and in the lobby for threat detection. The system can also be used as a badging process for contractors (electricians, exterminators, etc.) to ensure the individuals are known and safe.